I got this bottle last Christmas, and we decided to try it at a new Greek restaurant that we hadn’t been to before: Claypot at Gordon, which was really good. I was hoping this wine wouldn’t be too robust for M., who prefers the smoothness of merlot to the stronger flavours of cabernet suavignon and shiraz. Well I needn’t have worried, as this was a very smooth number, with little to no oak evident to my untrained palate, and very low levels of tannin. 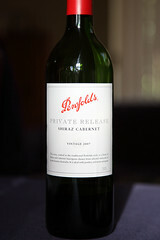 It had some robustness, but not in that oaky flavour complex that can seem overpowering at times. The aroma was… plummy – that’s about the best I can do I’m afraid. There was maybe a hint of spice in there too, from the shiraz no doubt, but not very strong, and none of the peppery notes that I’ve detected in shiraz before. The taste was very smooth on the tongue. I picked the dominant flavour as plum-like, with a hint of raisins and some spice, perhaps a tough of aniseed. A little bit like a spicy fruit pudding, though not sweet at all. It was very… “round” in the mouth – I’m not sure if that’s the same thing that wine experts mean when they say a wine is “round”, but it feels right. We didn’t finish the bottle, and it took me a few days to get back to it, at which point I decided not to drink the small remainder, but to make a poached pear in red wine with cinnamon, cloves, and allspice. Which I’m eating right now. Yum.